The best way to clean any room in the house is to come up with a weekly cleaning routine to help you clean it easily and effectively. Today we’re going to walk you through the best way to clean your kitchen in a few simple steps. First things first, before you begin you’ll want to gather all of your cleaning supplies so that you’ll have everything you need handy. After you’ve gathered your supplies you can start the kitchen cleaning process. You want to start the kitchen cleaning process by dusting everything from top to bottom. Working from top to bottom prevents you from having to redo any work you’ve previously done. And while you’re doing this you’ll want to remove any trash from the countertops (and other places that it doesn’t belong) so that you can move on to checkpoint number two. Next you’ll go around and pick up and trash or spoiled food and throw it away before taking out the trash. Nothing more to it, this steps pretty simple. Now you can start to do the dishes by either washing them and setting them out to try or rinsing them and putting them in the dishwasher. Once you’re finished with the dishes you can start to work on your sink (cleaning the sink is an important part of kitchen cleaning). Spray it down and let it disinfect for about 4 to five minutes before scrubbing it down and rinsing it with hot water. 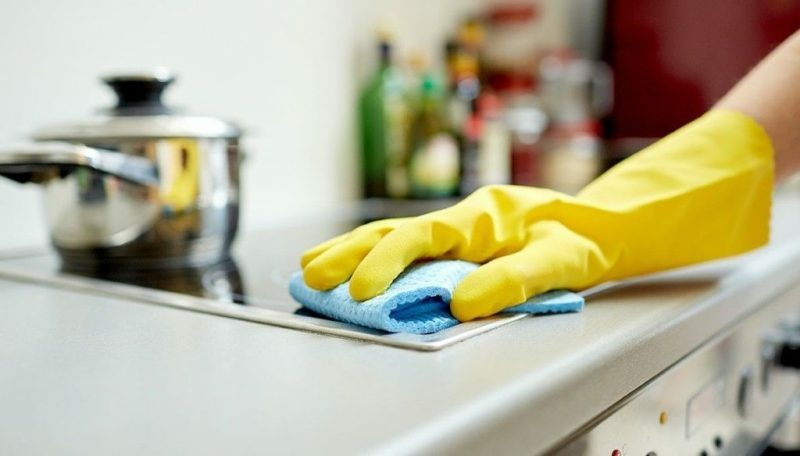 Once you’ve dusted, taken out the trash, done the dishes, and cleaned the sink you can now start to disinfect and clean all the touchable surfaces in your kitchen. This is your countertops, your microwave, drawer handles and knobs, the handles on your refrigerator (and the outside of it), and anything else that you or your family may have touched. Go around and spray the surfaces with your disinfectant and allow it to sit for at least 1 minute before taking your cleaning cloth to it. The very last thing you want to do when cleaning any room in the house (but especially the kitchen) is clean the floors. You’ll work from the inside of the room to the outside of the room when sweeping, vacuuming, and mopping the floor so that you don’t have to backtrack. And that’s really all there is to it when it comes to kitchen cleaning. The more you settle into a cleaning routine the easier it is to clean it each week. Need help cleaning the kitchen in your home? Contact us today and see how one of our professional house cleaners can assist you.